The thermal infrared (TIR) region of the electromagnetic spectrum is mainly used by volcanologists to investigate both the thermal and compositional characteristics of volcanic processes and products. This is done using a suite of orbital and airborne sensors. Some sensors such as the high-temporal/low-spatial resolution Advanced Very High Resolution Radiometer (AVHRR) and the Moderate Resolution Imaging Spectroradiometer (MODIS) are used as monitoring tools to detect new thermal activity or the presence of volcanic ash plumes. Higher spatial resolution sensors such as the Advanced Spaceborne Thermal Emission and Reflection Radiometer (ASTER) or the Landsat Thermal Infrared Sensor (TIRS) are used to map smaller-scale deposits and processes. A wide variety of work has been performed using these sensors, including investigation cooling rates, surface textures, and compositions. This work has been expanded upon at the University of Pittsburgh by creating new ground based instrumentation to obtain detailed multispectral TIR image datasets of eruptive processes. The goal is to use these new tools and datasets to capture scales of volcanic processes (such lava flows and volcanic ash columns) never before possible. The instrumentation that has been developed use two FLIR broadband thermal infrared cameras paired with a series of TIR wavelength filters design to allow multispectral image data to be collected. There are two different systems designed for different application and portability. The first and older prototype system was developed using a FLIR S40 camera, which acquires 240 x 360 pixel TIR images. This camera has an uncooled microbolometer, and is capable of obtaining moderately-high speed image data (30 Hz). The six bandpass filters were initially designed to be manually placed in front of the camera lens, to allow six multispectral images. The six filters were fabricated to replicate the ASTER and MODIS TIR channels as well as those proposed for the future HyspIRI TIR instrument. These filters are now housed in a motorized wheel assembly, which can rotate and a range or predetermined speeds depending on the process being observed. The standard rotation of once every 3.5 seconds is typically used allowing 4-5 images per filter to be captured and averaged. Figure 1. 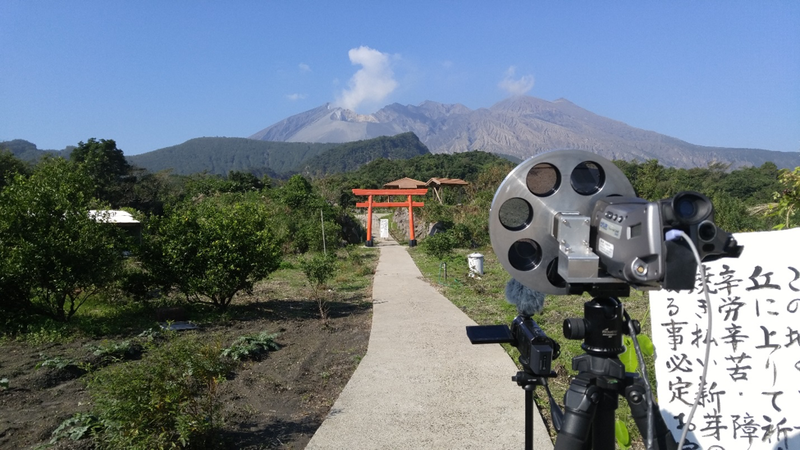 The original multispectral thermal camera system in operation at Sakurajima volcano, Japan. The wheel design allows for camera stability, and the rate of rotation means near-coincident image sets at each wavelength (as well as a broadband temperature image) can be obtained of a target. To date, the camera has collected a large quantity of field data from Hawaii, Guatemala and Japan (Figure 1) during field campaigns over the past 7 years. The data collected from this camera have been used both as a proof of concept, but also to collect image data of ash rich eruptions from both Fuego and Santiaguito volcanoes in Guatemala. Spectral analysis of this data is ongoing, as are updated calibration methods, so that isolation of emissivity in each bandpass filter image can be acquired more accurately. A second, much smaller camera system has recently been developed, which has adapted the principals from the first prototype. The entire system is encased in a weatherproof TIR instrument housing (Figure 2). The system incorporates the same six filters paired with a FLIR A65 TIR camera. This camera has an uncooled VOX microbolometer detector and is capable of acquiring larger image sizes (640 x 512) than the S40 but at a lower frequency (7 Hz). The instrument system is also being developed along with software to capture, correct, and post-process the data automatically. Currently, the capturing and organization of data has been automated, with the calibration of the system and development of the correction algorithms ongoing using laboratory blackbody and whole rock samples (Figure 3). These experiments will determine the lens/filters attenuation and internal instrument radiance so that the transmission attenuation of the lens, filters, and the view path within the housing can be determined. Figure 2. New multispectral FLIR camera system within the housing as well as the computer/power housed in the weatherproof case. The FLIR housing has the IR front cover removed to show the filter wheel and six, 18 mm filters. Figure 3. Initial test for the multispectral TIR instrument system using an obsidian sample heated to ~390ºK. (A) Visible image, (B) Broadband (7-13µm) FLIR temperature image and (C) Emissivity spectrum extracted from the area shown in B (red square). Note the decrease in emissivity around the 9.1µm, characteristic of a silica feature. However, further calibration is needed to address the instrument and atmospheric attenuation at 8.04 and 11.35 µm (bands 1 and 6). Further testing for both systems is planned during an upcoming lava-pouring experiment at Syracuse University, as well as detailed calibration at the Aerospace Corporation in El Segundo, CA. During these tests, a more systematic correction for instrument emissivity and temperature change will be determined by radiance modeling of the internal optical path. External environmental factors such as atmospheric temperature and humidity will be measured. 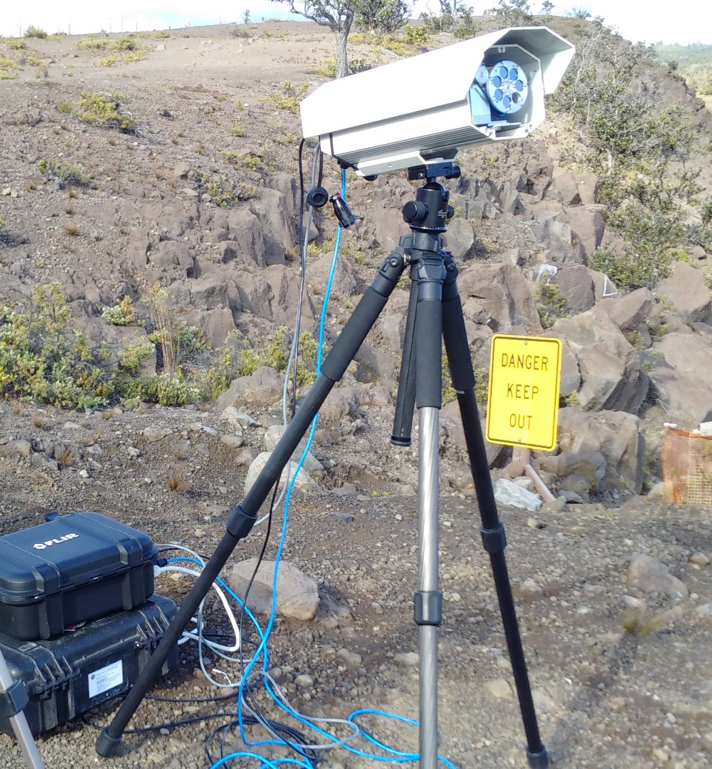 The second system will then be again deployed to Hawaii to acquire multispectral TIR data during the day and night of both the lava lake and active pahoehoe surface flows at Kilauea. The data collected will be used to determine how emissivity changes from the molten to solid state and improve inputs into flow propagation modeling. This aspect of the work is funded by NSF (1524011) and NASA (NNX15AQ72H), whereas the development of the new camera system was funded by NASA (NNX15AU50G). Lee, R.J., Ramsey, M.S. and King, P.L., Development of a novel laboratory technique for high temperature thermal emission spectroscopy of silicate melts, J. Geophys. Res., 118, doi:10.1002/jgrb.50197, 2013. 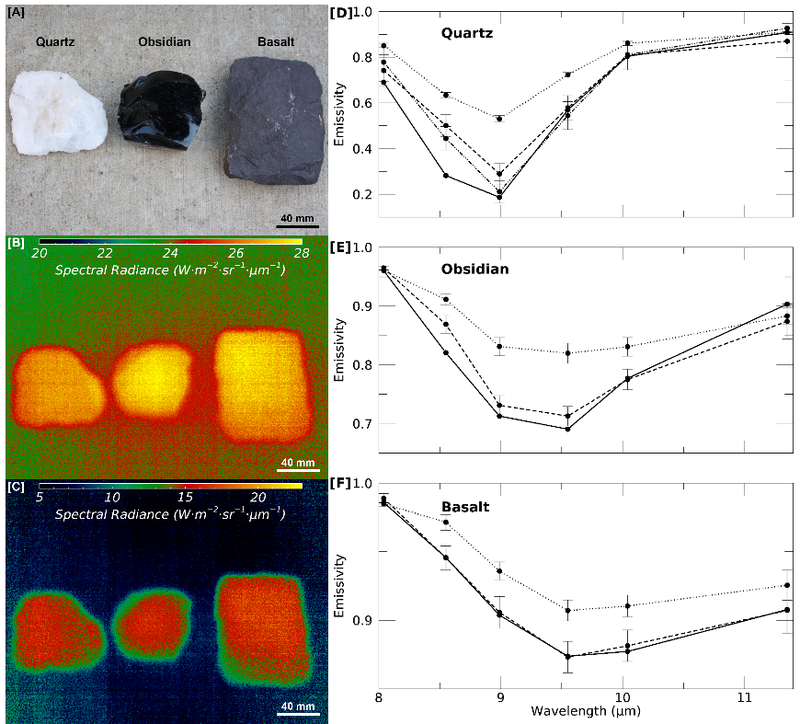 Ramsey, M.S., Synergistic use of satellite thermal detection and science: A decadal perspective using ASTER, Detecting, Modelling and Responding to Effusive Eruptions, in: Harris, A.J.L., De Groeve, T., Garel, F. & Carn, S.A. (eds. ), Detecting, Modelling and Responding to Effusive Eruptions, Geol. Soc., London, Special Publications, 426, doi:10.1144/SP426.23, 2015. Ramsey, M.S., Synergistic use of thermal infrared field and satellite data: Eruption detection, monitoring and science, Geophys. Res. Abs., vol. 17, abs. EGU2015-9121, EGU General Assembly, 2015. Ramsey, M.S. and Harris, A.J.L., The thermospectral infrared properties of active basaltic flows: Constraining petrology, lava cooling and flow propagation models, 26th IUGG General Assembly, Abst. & Prog., 2015. Ramsey, M.S. and Harris, A.J.L., Volcanology 2020: How will thermal remote sensing of volcanic surface activity evolve over the next decade?, J. Volc. Geotherm. Res., 249, 217-233, 2014. Ramsey, M.S. and Lee, R.J., A new thermal camera system for compositional analysis of geologic surfaces, IEEE Geosciencecs, (in preparation). Williams, D.B. and Ramsey, M.S., Ground-based analysis of volcanic ash plumes using a new multispectral thermal infrared camera approach, AGU Fall Meeting, 2015.